Atlanta-based composer Klimchak creates playfully experimental works for film, theatre and dance, which he performs himself. 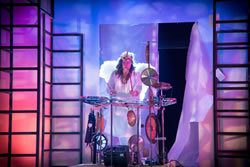 Each piece features a unique, often conceptual setup, involving theremins, looper pedals, found objects, eccentric homemade instruments and the proverbial kitchen sink. This interview was conducted via email from 28 August – 8 September 2016 and has been edited for clarity for its publication in eContact! 18.3. [Adam Scott Neal] I’d like to first delve into your piece CooksNotes — I’m not sure if this is, or will turn out to be, your magnum opus, but for me it encapsulates many of your recurring ideas. What drove this concept? Was it born out of previous pieces and performances, or did you visualize it all before beginning? [Klimchak] Although CooksNotes does incorporate many of my compositional concerns, I see it as a separate thing from most of my work. The piece, which is really almost 20 years in the making, is an attempt to resolve the two public activities that give me the most pleasure: cooking and composing/performing music (Video 1). I worked as a professional chef to support myself in the early 1990s while transitioning to make my living as a composer/performer. Once I was able to make a meagre living from music, I quit cooking professionally. Cooking became a beloved hobby, something I did to relax; CooksNotes was an attempt to integrate those two worlds. Video 1 (3:23). Promotional video for Klimchak’s CooksNotes (2015) performed by the composer at the Goat Farm Arts Center in Atlanta, Georgia in March 2015. Video by Brock Scott. I made musical instruments out of kitchen implements, wrote music for those instruments and designed recipes to be made with them. For the show, I did a concert of the music while cooking the recipes. At the end there was a full meal prepared for the audience and I to share. This idea occurred to me in the early 2000s. I got some grants to do a quasi-improv version of the show at Nexus 1[1. Now the Atlanta Contemporary.] It sort of worked for me, but I lost a lot of money and I could not figure out how to make it repeatable. But folks who saw the show kept reminding me about it and asked when I was going to do it again. After a decade or so of this, I decided to take another shot at it. During this period my composing abilities and my instrument-designing skills had improved significantly, so I was able to sit down and write a full-length show. At the same time, the interest in specialty dinner parties had ramped up to where I could charge enough to make money on the show. I spent about three years creating the instruments and the recipes. The two are really interlocked. In some cases, I had a recipe and had to figure out an instrument that I could use to cook it, with the composition to follow. In others, I had an instrument and a composition, but needed to figure out what food to make with it. Much of your work is music for theatre. Can you tell me how you choose instruments and create material for these productions? I have a unique process for theatrical composing. I’ve never heard about anyone who uses the same method. In case you don’t know about how American theatre works, their process is usually to rehearse eight hours a day for between three and five weeks. The last week is on stage and includes tech; the rest is in a rehearsal hall (since there’s usually another play being performed during that time). I don’t pre-compose anything unless there are specific songs that I need to write for the actors to perform or specific themes that are needed in advance for the production. I do talk to the director and designers before rehearsals to get a general idea of the vision for the play. Before rehearsals begin, I select between 30 and 60 instruments that I think might be appropriate to fulfill the play’s vision. Once rehearsals begin, I bring that entire truckload of instruments into the rehearsal hall and begin improvising along with the actors. As the production begins to develop, I bring in new instruments as needed (and remove ones that aren’t working). By the end of rehearsals, I have composed a full score, including themes and underscore. It functions much like a film score, but with the addition of full-out themes for the beginning, end, intermission and other areas that are music-driven. What informs your use of everyday objects? Is it primarily their sounds, or their social connotations? I’m curious of course about the kitchen utensils in CooksNotes, as well as the saw blades in Ocean of Milk. My history of working with objects started with poverty. I couldn’t afford real instruments so I used found objects to substitute for them. The saw blades were first used for a 1996 version of Othello at Georgia Shakespeare. 2[2. Georgia Shakespeare, formerly Georgia Shakespeare Festival, was a theatrical organization that ran from 1986 to 2014.] I wanted a bunch of gongs, but didn’t have any. I discovered that saw blades, when suspended and struck right in the middle, have a tone then an upward bend like opera gongs. I got a bunch, tuned them to an approximate pentatonic scale, and used them as the basis of the score. I’ve been collecting them ever since and have used them in a variety of scores. The last was a version of As You Like It in which I mounted them on a cart, along with a theremin, and used their points to burst through a paper wall onto the stage (Fig. 2). Video 2 (1:03). Dress rehearsal (22 February 2009) for a performance of To Bring Into Being, with music by Klimchak and choreography by Lori Teague at Emory University. Particularly in theme-based material, I do pick objects for their meaning. The cooking implements were picked both for their sound and because that was the theme of the show. Another example of this approach is a score I wrote for a dance about evolution, To Bring Into Being (2009). For that, I designed instruments that were a part of a desk. During the performance I sat at the desk, dressed as Darwin, and performed the score. To represent the evolution from ocean to land, I designed a lit aquarium in one of the drawers. When the drawer was pulled out, pieces of struck metal could be partially submerged in the water, which would distort and pitch-bend their sound (Video 2). CooksNotes involves, among other things, a synth made from blenders and a theremin-controlled Rubens tube. What other kinds of homemade electronics have you built or experimented with? Honestly, those are the first two homemade electronic instruments I’ve designed and built from scratch. I’ve made a couple of pedals and one of my theremins from kits, but that’s not really the same thing. There are so many amazing electronic instruments and instrument designers now that I generally leave it to them. My main electronic composing instrument, my Buchla Marimba Lumina, is far beyond anything I can make, so I’ll save my time for designing acoustic instruments that I need for specific projects. I have spent a fair amount of time researching, designing and building various contact microphones for amplifying and changing the sound of my homebuilt instruments. Different types of contact microphones make a huge difference in the resulting sound. I’m very interested in using these with various effects (from guitar pedals to complex Max scripts) to radically alter the sounds of small instruments. One of my favourites is the coffee bomb, a coffee thermos with embedded pickups between the twin metal layers of the shell. It’s held at the top, and hit with a stick. Changing the angle of the thermos changes the pitch and timbre of the sound due to the water placement within. This is run through various electronic effects and gives me a small, distorted orchestra of sounds. Tell me a bit about your hunting process — how do you find instruments, and how do you store and organize all of your stuff? For a start, thrift store shopping is a family business for us. My wife is an assemblage artist. Found objects are very important to her work, as they are to mine. 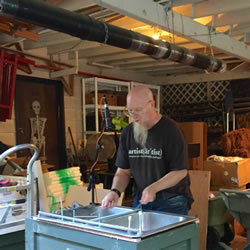 We spend about a day per week making the sweep of thrift and bargain stores for raw materials. So I have a vast collection of toys and other objects that make odd sounds, all ready to be used and altered as necessary. In addition, I’m on a first-name basis with workers at most of the hardware stores in Atlanta. I usually shop those while carrying a case of different sticks and bows to test sonic abilities of objects. In my case are also a stethoscope and a small battery-powered amp with a contact pickup to test for very low-volume sounds that can be amplified. Storage is a major problem for me. 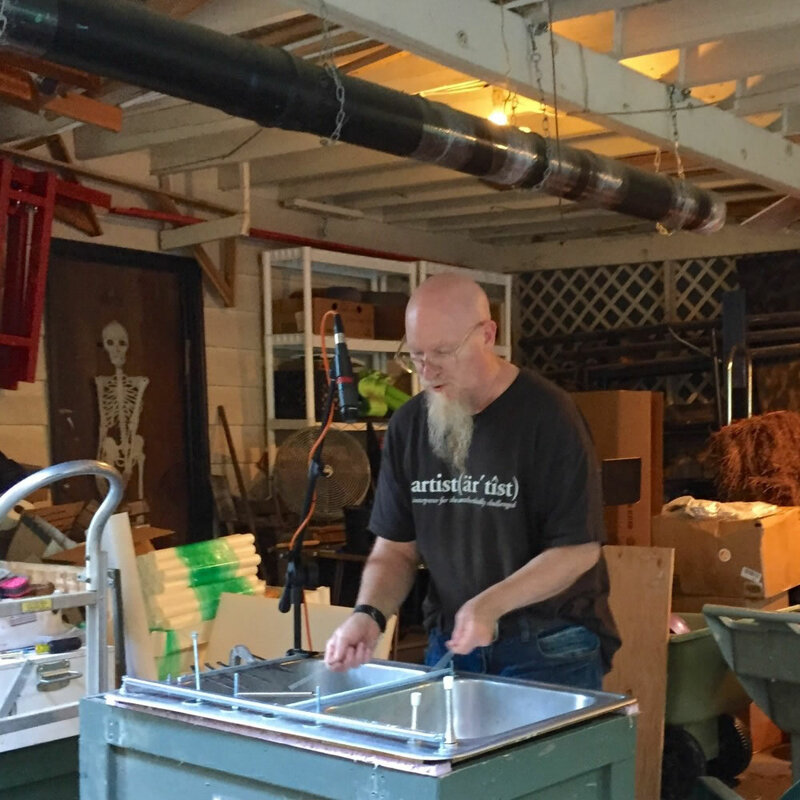 I do have some off-site storage for very large instruments and instruments that are affiliated with specific shows like my theremin bike and the instruments for CooksNotes. The rest are in my studio, which is a converted two-car garage, completely lined with shelves and filled with instruments in various states of construction. I am working on a computerized master index with photos of each object along with its exact location, but that’s a large project, which is currently supplemented with my memory of where stuff is. When you’re preparing for an improv performance, how do you choose what instruments and objects you’ll bring? The first thing I do is consider the circumstances. The location is important. 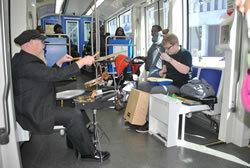 When we played together on the Atlanta Streetcar 3[3. 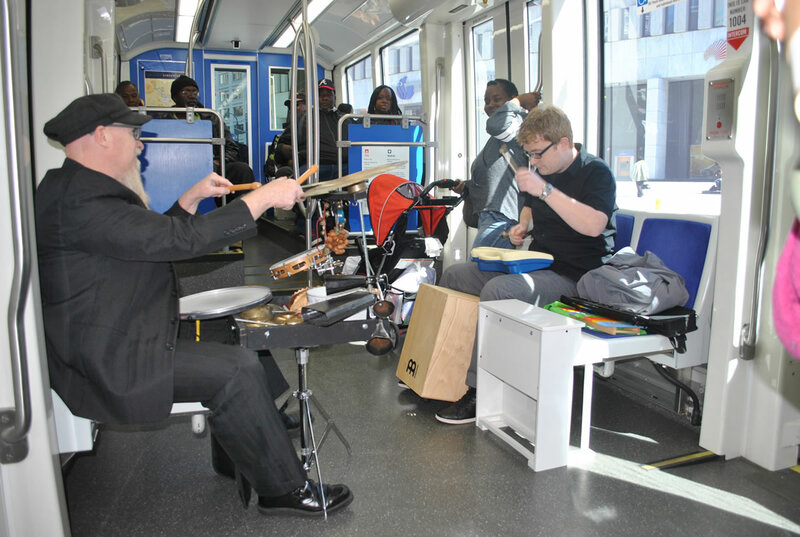 The author and Klimchak performed an hour-long improvisation set on the Atlanta Streetcar in October 2015, along with the ensemble Bent Frequency. This was part of the Elevate Atlanta project, sponsored by Mayor Kasim Reed’s office. ], the fact that we had to jump on the streetcar quickly and begin playing amongst the riders dictated a quick load setup, and a limited number of (very small) instruments. Also, since the performances were under the sponsorship of Bent Frequency (a new music ensemble), I picked instruments that would fit into that universe. The other players and their instruments also matter. When I played with Marshall Allen last year (leader of the Sun Ra Arkestra), I knew that the centre of my rig had to be a drumset of some sort, since at least part of the performance would be based on a jazz quartet. I added some electronics and some homebuilt percussion for surprise textural elements. Once I’ve allowed for the location, style of music and the players, I take a little tour of my studio to see what might be interesting. Since my collection encompasses many, many instruments (I stopped counting after a thousand), I have an almost infinite number of combinations. And in fact, I often discover new compositional ideas this way since I am utilizing five or six instruments that I’ve never played before as a group. At the same time, there is a bias toward whatever I’m currently working on compositionally. If I’m working on a composition for theremin, it’s almost inevitable that I will bring a theremin as one of the instruments, since I’ve been practicing and thinking about it. Improvisation, while a good thing in itself, is always a part of my method for gathering compositional material. Which other players in Atlanta have you enjoyed improvising with? How did you play off each other? Since improvisation is for me a part of my compositional method, I mostly tend to do solo performances. If I gather material from other players, there is some difficulty (at least in my mind) about authorship. While I know that an idea that I grabbed on the fly — and that all the improvisors were working on at the same time — isn’t likely to be viewed proprietarily by the participants, it’s still a red flag for me. So I don’t do it too much. That said, I do really enjoy the conversational aspect of a duet. So as long as I can keep my bloody compositional hat off, it’s a lot of fun. 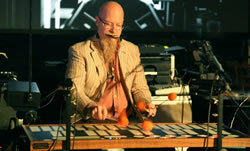 I’ve really enjoyed playing numerous times with master percussionist Stuart Gerber. He has played with me for several open-ended compositions I wrote for Art on the Beltline. 4[4. Art on the Beltline is an ongoing, juried exhibition sponsored by the city of Atlanta. The “beltline” refers to a series of disused railway beds that circle the city and are being revitalized as public parks, walkways and eventually a light rail system.] I like playing with him because, despite a prodigious level of technique, he employs a childlike sense of discovery and playfulness. My favourite with him was a 2011 Beltline performance titled Trio for 2 Percussionists & Urban Woods. We were each in the dark on opposite sides of a ridge, listening to each other and incorporating the summer sounds of Atlanta into our performances on homebuilt instruments. The audience was at the bottom of the ridge between us. Each of us had a long delay line we mixed into two widely spaced speakers. The audience was unsure of where we were actually located (as well as how many of us there were). Video 3 (0:52). Excerpt from Percussion Discussion (2010), performed by Klimchak and Stuart Gerber under the bridge at Monroe Drive and Virginia Avenue in Atlanta on 26 June 2010. What do you think about the concepts of playfulness and kitsch? This strikes me as a recurring element in your works. I love kitschy things! And playfulness. And humour. One of the reasons that I’m always on the lookout for alternative performance spaces is that the traditional places have audiences that seem to have a disposition towards “serious” music. And a lot of modern music is very funny! As a matter of fact, I think humour and playfulness are a way into modern music for folks without much of a background in it. And to be a successful composer, I feel like you need to attract both folks who know exactly what you’re doing as well as folks who don’t know, but want to — humour opens that door. In my piece Synesthesia (2012), four percussionists are tasked with memorizing a percussion score. But to perform the score, they recite the rhythms using the words red, green, yellow and blue (Video 4). While they recite the score, they flash appropriately coloured lights. The audience gets to see and hear the piece at the same time. And it’s funny. But it’s still a serious percussion score. Video 4 (0:31). Rehearsal of Synesthesia performed by Isaac Anderson, Stuart Gerber, Olivia Kieffer and Klimchak. The premiere took place at the Historic Fourth Ward Skatepark in Atlanta on 3 November 2012. In addition to found objects, you employ commercial audio gear — like looper pedals. Using those seems a bit dangerous to me, since it’s so tempting to make purely accumulative music. I think you avoid this well in pieces like Speaking Non Synths — what is your strategy for form in a piece like this? Use multiple cheap loopers. They all have slightly different features and slightly different approaches to “rounding” loops. The result is that things sound less loopy and more spontaneous. Plus, it lets you bounce things between them like the old tape dubbers did, which degrades and changes the sound. Use long loops. Many looper folks use a single measure as their loop length. This locks you into a pop format. I try not to even count my first loop. That way even I’m surprised about the loop point as I layer more on. Turn them off sometimes. There’s no reason why a piece can’t have live parts as well as looped parts. In addition, there’s no reason to record the whole length of a loop. I often make multiple passes through a loop, just recording accents and random bits through each iteration. Also, the first beat or two of a loop can become a great rhythm track itself if you rapidly flip the looper on and off in rhythm. Use different effects during loops. Different effects on different loops (and even different parts of the same loop) are a great way to change things up. Adding some after the loopers can change up a whole looper set on the fly… which can then be re-recorded (all or in part), etc. Close miking is your friend. When I want to change up a loop, I use the microphone to slightly overdrive the input to the looper. In addition to changing the timbre of the instrument (for the loop versus in the room), this drowns out the preceding loops. This new loop can be a stepping off point for the whole loop to go in a new and surprising direction. This piece (among others) features some haunting vocalizations inspired by throat singing (Video 5). How does the human voice fit in or contrast with the rest of your music, which seems concerned with “things”? Video 5 (1:19). Excerpt from Klimchak’s performance of Speaking Non Synths at the Asheville Electro-Music Festival in May 2015. I started playing theremin because (as I mentioned above) I needed it for a score for theatre. In 2000, I was commissioned by Georgia Shakespeare to do a score for Tartuffe. I wanted the score to be about mesmerism. Theremin seemed like the right instrument to feature in that score. I’ve worked on playing theremin on and off ever since. Like most of my instruments, the on-time is when I get a commission or performance that uses theremin. The off-time is when other instruments need to take precedence. Unfortunately, since theremin is an incredibly difficult instrument to play, that still makes me an intermediate player. I can play a specific melody line if I rehearse it, but I’m not good enough yet to sight-read with it. The theremin bike (Fig. 4) has evolved in several stages. I first built it in 2013 for my score to The Navigator 7[7. This work was awarded a Suzi Award, which recognizes excellence in professional theatre in the Atlanta area. ], which was a large scale, interactive theatrical spectacle staged across the entire space of the Goat Farm. 8[8. The Goat Farm Arts Center is an arts complex and promotion entity housed in 19th-century industrial buildings in northwest Atlanta.] I used a lot of theremin in the show and needed a way to move it as much as quarter mile between scenes. I mounted it to a bicycle for ease of transportation. I added an amplifier and ran the whole rig from a computer backup UPS. 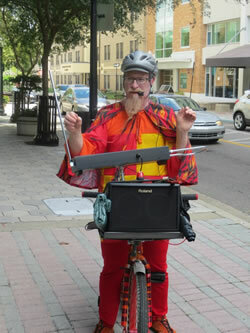 Last year I was commissioned by Art in Odd Places Orlando to compose a work for theremin bike. I added some guitar pedals and a microphone to the basic rig so I could alter the sound of the theremin, add in loops where needed and do vocal parts, as well as use my bicycle helmet for a drum. I wrote six short pieces and rode the bike between various locations, performing a different piece in each location. Before I left each location, I set up a simple loop that served as a soundtrack for my trip between locations. I repeated the show this year in Atlanta as part of the Little Five Points Arts Alive festival. Quite often, you’ll post work-in-progress videos, either recorded in your studio or workshop performances. How does this assist your process? Do you seek feedback, or are these primarily promotional? I always welcome feedback. Feedback will almost always improve the final product, even if it’s just to prepare me for some criticism later that I hadn’t thought about. As a matter of fact, that was one of the best things about CooksNotes. Because after the show, I sat down with the audience and ate while talking about the show. It’s astounding how much great and honest feedback I got in that safe space. Much of the feedback I got during the workshop performances got incorporated into the later version. Even some of the feedback I got from the earlier improv version of the show (which I fortunately wrote down) became a starting point for the new show! But while I like feedback, that’s not why I post in-process videos. Nor is it promotional (although it does help with attendance at shows). I do those in-process videos because I really believe in the value of process as a part of the final art. I wish I could hear the 337 variations that Bach rejected! So for me, it’s important that I document the process that I go through in creating new work, for it’s own sake. Also, it’s fun for me to look back at earlier pieces years later and revisit my own progress. It’s important for the public to understand that these things don’t spring forth from composers’ minds fully formed. There is a lot of work, a lot of testing, a lot of bad ideas and a lot of bungled rehearsals before the chaff is separated from the seed. In a similar and related vein, I genuinely believe that it’s the job of an improvisor to stink at least part of the time. If you’re not making mistakes, then you’re not actually improvising, but rather, just running through things you’ve already practiced and learned. That’s why I post in-process videos where I’m just trying things out, and leave my mistakes in them. I think art is a process, and the public needs to understand and enjoy being a part of that process. We’re not gods, who make no effort — but eventually, through sweat and labour, we might attain perfection in our finished work. My next major project is a commission for Art In Odd Places Orlando in November. I’ll be performing an original composition titled When You Whistle, It’s Not Work on a musical instrument made from a kitchen sink (Fig. 5), which contains elements of percussion, string instruments, wind instruments and vocals, along with electronics. In When You Whistle, It’s Not Work, I will be literally transforming work into play by making music on the ultimate drudge device, the kitchen sink. The sink is normally thought of as a tool for the most hated kitchen task, washing dishes. This performance blends modern classical music with the joy of a young boy playing on pots and pans in the kitchen. And people have joked for years that I play everything but the kitchen sink. So this year, I’ve added that to my repertoire. Adam Scott Neal is a composer whose work ranges from chamber music to video to circuit bending. He earned a PhD at the University of Florida and previous degrees at Queen’s University Belfast and Georgia State University. 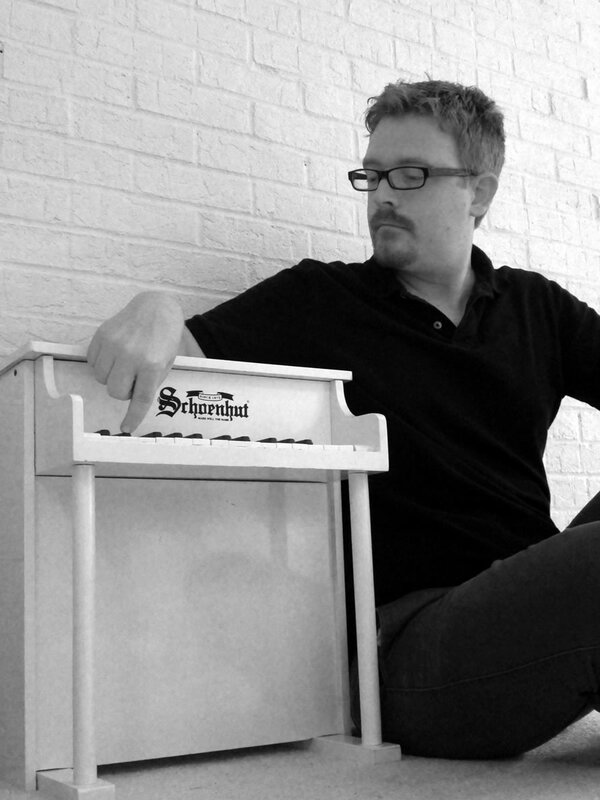 He has composed for Bent Frequency, Beo String Quartet, Chamber Cartel, Guidonian Hand, Iktus Percussion, loadbang and Transient Canvas, among others. His work also shows up regularly on acronymic conferences and festivals such as EMM, IHS, LAC, NACUSA, NYCEMF, SCI and SEAMUS. He works at East Carolina University and runs the Composers Workshop at the Charlotte New Music Festival. eContact! 18.3 — Sonic DIY: Repurposing the Creative Self (December 2016). Montréal: Communauté électroacoustique canadienne / Canadian Electroacoustic Community.